* The captivating look of floating crystals and pearls will be yours with our 6-row illusion bracelet. * This wholesale bracelet is a chic wedding accessory. * The captivating look of floating crystals and pearls will be yours with Mariell's lavish 6-row illusion bracelet. 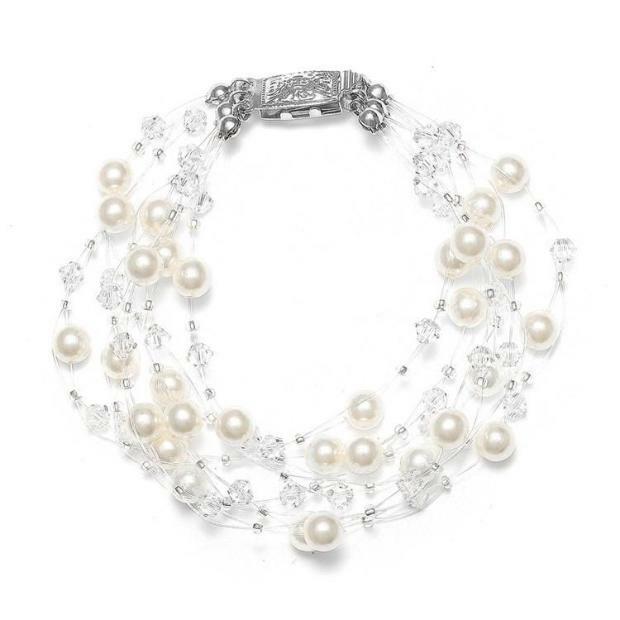 * This alluring bracelet features a bevy of dainty 4mm Austrian crystals and 6mm Swarovski crystal-based pearls hand strung on translucent illusion cord. * This delicate yet high-styled wedding accessory measures 7" and is proudly made in the USA. * This chic bracelet is shown in classic bridal Ivory/Clear and is also available in White/Clear. * This bracelet has stylish matching necklace style 2101N sold separately.